Having been threatened by numerous encounters with enemy troops in the Cam Lo area, on July 7, 1966, United States Marine Corps General Lew Walt led a joint U.S. Marine and ARVN force of 8,500 and 3,000 troops in a strike through the Demilitarized Zone (DMZ). Plans to maintain U.S. occupation of the Cam Lo area in the Quang Tri province soon became known as Operation Hastings. The major clash between the allies and the invading North Vietnamese occurred in July 1966. 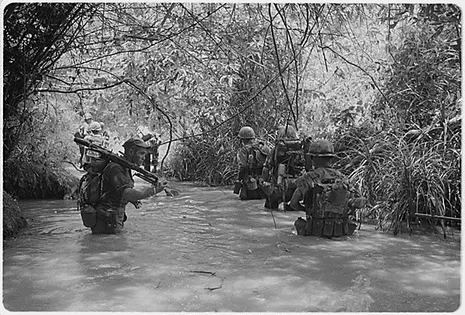 For several weeks before this time Marine reconnaissance teams had been sighting groups of North Vietnamese near the village of Cam Lo in the east central part of Quang Tri Province. By early July reconnaissance teams in the Cam Lo area were almost invariably finding themselves in contact with large enemy units. Interrogation of prisoners and analyses of captured enemy documents confirmed that no fewer than 5,000 regulars of the 324B Division of the North Vietnamese Army were in South Vietnam, preparing to overrun Quang Tri Province.